The National Marine Electronics Association (NMEA) has developed a specification that defines the interface between various pieces of marine electronic equipment. An NMEA standard defines an electrical interface and data protocol for communications between marine instrumentation. Advanced NMEA Data Logger captures NMEA data streams from GPS, navigation or any other NMEA compatible device directly into file, Excel, Access, any database or another Windows application. 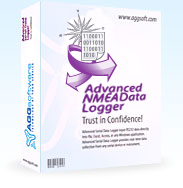 Advanced NMEA Data Logger provides real-time data collection from any device or instrument. What problems can be solved with Advanced NMEA Data Logger? A typical application for Advanced NMEA Data Logger is to log and aggregate data from one or more NMEA devices to disk or a software replacement for a hardware data logger for your GPS or NMEA external device. Getting started is easy. Advanced NMEA Data Logger is ready! After installation start Advanced NMEA Data Logger from the Start Menu. Click the green plus button and choose the communication parameters for your GPS or NMEA device. Then define how you want the serial data to be parsed, translated and exported. Windows service mode. Unlike most other serial logging applications, Advanced NMEA Data Logger can run as a service so that it starts as soon as the operating system starts and doesn't require a user to log in and run it. It will continue to run even as users logon and logoff the workstation. It is extremely easy to use! The configuration process is fully menu driven and has complete, context sensitive, on-line help. You can easily customize all input to your exact specifications. Once you see how easy it is to use Advanced NMEA Data Logger, you will never again take data readings by hand!